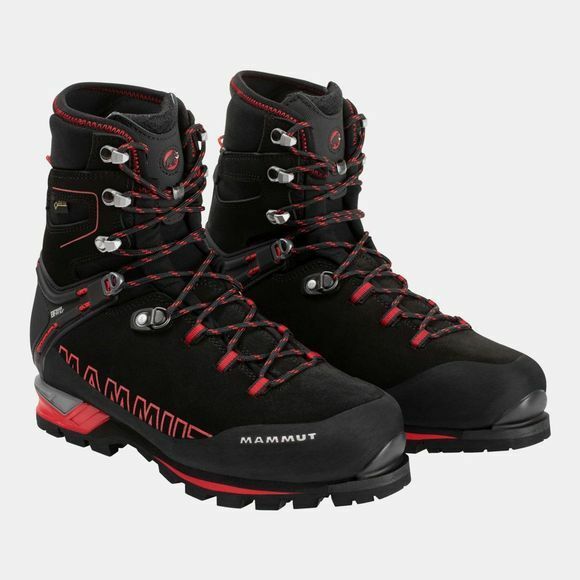 The Mens Magic Guide High GTX Boot from Mammut are high, supportive and fully crampon-compatible mountaineering boots made from high-quality Perwanger full-grain leather and with an elastic fabric around the tongue, flex zone and heel collar. It features an all-round protective rubber rand, 3-zone lacing with efficient D-ring locking and the patented Base Fit 2.1. This is free sliding on the shoe outer above and below the heel bone using a Mammut Hammer cord, which significantly improves heel support and reduces blistering. Support is further enhanced by the 3D-shaped heel cushioning. Memo foam, an elastic Gore-Tex tongue construction, the Gore-Tex Duratherm Comfort Footwear membrane and a securely closing integrated half-gaiter ensure the inside is dry and warm. The precise connection to the shaft is due to a light wedge made from poro, PU and TPU, which offers lasting cushioning. The proven Vibram Maton sole completes this visually compelling product.